Earlier this month, I traveled to the small, sleepy city of Nome, Alaska to shoot (and co-star in!) a documentary-style feature film on UFO sightings, alien abductions, "little people", and all things paranormal (seriously). Located on the edge of the Bering Sea on the southwest side of the Seward Peninsula, Nome, with a population of 4,500, is probably best known as the end point of the annual Iditarod Trail Sled Dog Race. 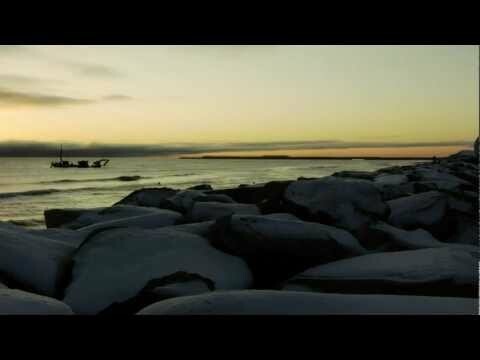 Nome is also known as a city where people disappear. From the early 1960's to 2005, 24 people reportedly went missing, 9 of whom were never found. Rumors of a serial killer on the loose to alien abductions began to spread. In 2005, the FBI was called in to investigate. They attributed the disappearances to excessive alcohol consumption and a harsh winter climate. The recent film, The Fourth Kind (supposedly set in Nome but actually filmed in Bulgaria and Canada) which is loosely based on true events, makes the case for alien abduction as the cause for the disappearances. During the Nome Gold Rush of 1899-1909, Nome was the biggest town in Alaska with a population estimated over 20,000. What remains from Nome's Gold Rush architecture isn't very grand at all as the city has been battered by devastating fires (1905 & 1934), and severe storms (1913, 1945, & 1974). It still possesses, however, a mysterious charm. Click HERE for my "Images" video on Galicia, Spain. Subscribe in a reader and never miss a new post or video. You won't be sorry...promise. Back to the Future: Observations on Villeneuve's "Blade Runner 2049"